Our vet will give you an “spot-on” treatment to put on your pet to help eradicate its flea problem. This will work in the short term, but your pet will need regular treatment to ensure the infestation does not return. Write reminders or place stickers on your calendar so that you don’t forget! Will spot-on flea treatment be enough to combat flea infestation? If applied to all animals in the house on the same day, spot-on treatments will certainly be a good initial step to getting rid of a flea infestation. 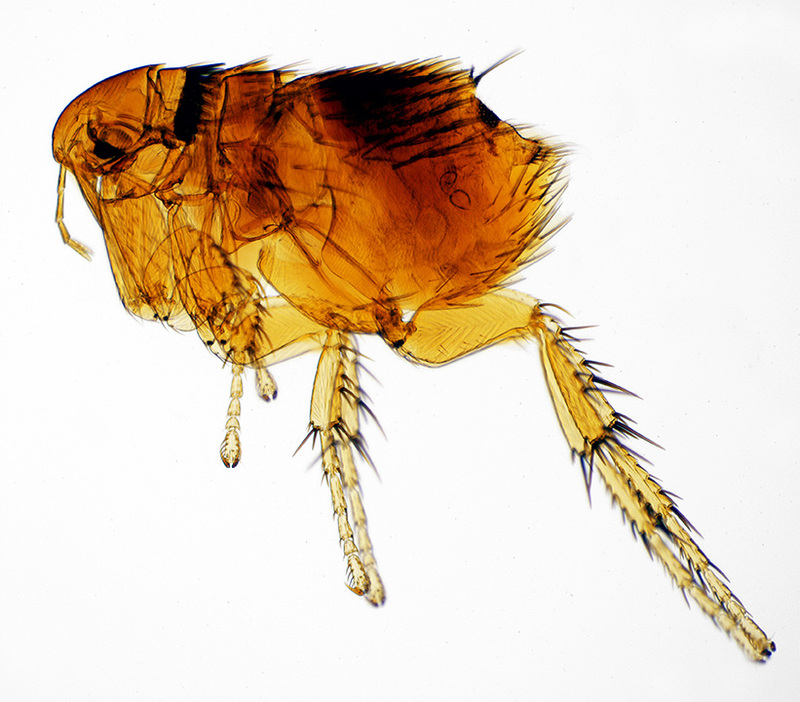 However fleas are extremely persistent and tough. The flea life cycle allows for flea pupae to lie dormant – in carpets, blankets, upholstery etc; for up to a year. Consequently, there is a strong possibility that you will have to treat your home too. We can help by providing a good environmental flea spray to do this. Where should I use the spray? You will need to spray everywhere your pet regularly goes within the house, and in your car too, as well as in your pets travelling box! But before you spray, you will need to prepare the house properly. Prior to spraying, you should thoroughly vacuum all floors and upholstered furniture – including the pet’s bed (although you might want to consider replacing the pet’s bed altogether). Remove all your pets, including birdcages. Remove or cover fish tanks and aquaria, and turn off aerator pumps until the room has been ventilated after spraying. Extinguish all sources of naked flame – including pilot lights on gas fires, ovens and boilers. After spraying, evacuate the rooms affected for half an hour before ventilating thoroughly. Vacuum daily for a week after spraying, as this will encourage flea pupae to hatch out so that the emerging young adult fleas will come into contact with sprayed surfaces. You can also spray inside the hoover bag prior to hoovering. Check with us to see if the spray you are using is licensed by the health & safety executive for domestic use, or use a spray purchased from our practice. We advise regular, year-round treatment against fleas. Puppies – We recommend starting PROGRAM when you adopt your puppy, which is entirely safe for puppies, to help prevent fleas. If your puppy has adult fleas we may recommend STRONGHOLD (safe from 6 weeks of age), or EFFIPRO spray (safe from 2 days of age). Adult dogs – We recommend treating your pets with PROGRAM (a product you administer with food) monthly, and only using an insecticide (STRONGHOLD) as needed, which will be very infrequently. PROGRAM does not kill adult fleas, but instead works by preventing fleas from breeding; it must be given year-round to be effective. If PROGRAM is not used, we recommend either the STRONGHOLD spot-on monthly, BRAVECTO tablets every 3 months for fleas and ticks or a SERESTO flea and tick collar. Kittens – We recommend using STRONGHOLD spot-on. If flea control is required without deworming, we recommend FRONTLINE spray, which can be used from 2 days of age and has a large safety margin. We also recommend starting kittens on PROGRAM which can be used very safely all year round (more information below). Adult cats – we recommend PROGRAM to prevent fleas, either by 6-monthly injections or monthly liquid on the food, and only use insecticides as needed, which will be infrequently. PROGRAM is not an insecticide and is considered very safe as it only affects the flea and not the cat. For treating an actual live flea problem we recommend the insecticide STRONGHOLD spot-on for cats. NOTE: there have been reports of fatalities from the use of permethrin-based spot-on preparations on cats, which are sold for use in dogs through supermarkets and pet shops. Book a pet flea treatment appointment for your pet today by calling 01980 621999 or by using the link below to send us a message.